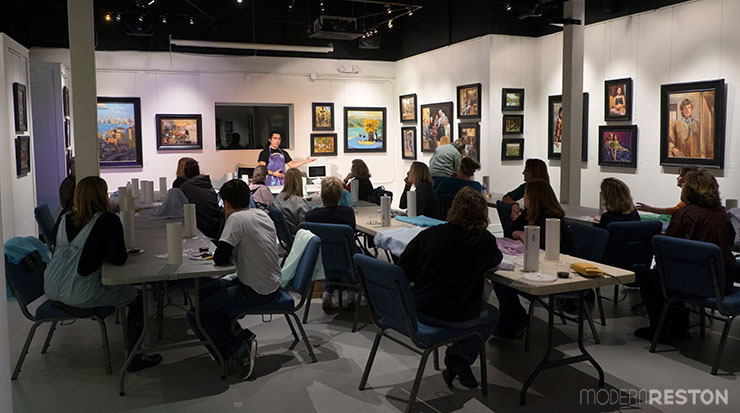 If you’ve ever wanted to experiment with a new art technique, or just go out for an unusual night with friends, look into the events at ArtSpace Herndon. On the second Wednesday of each month, this gallery hosts an evening of art instruction and socialization, called Design and Wine. 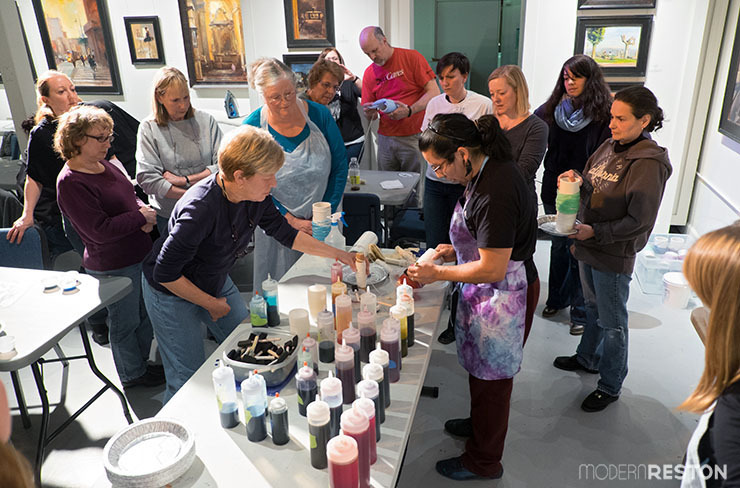 Each of these events is hosted by a guest artist, who guides attendees through the creation of an art project. 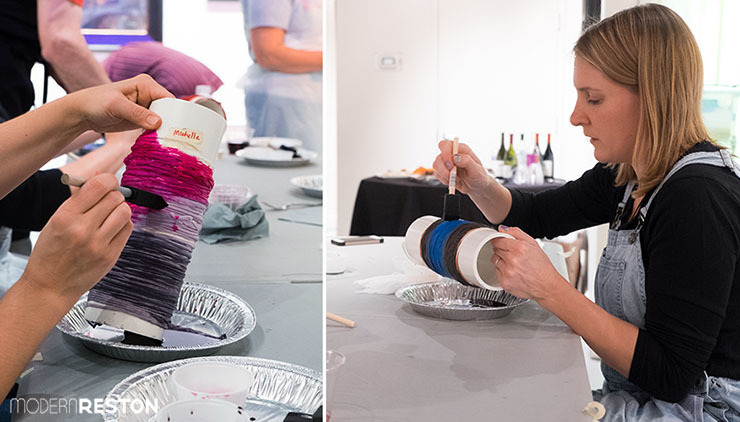 Past Design and Wine nights have included projects in painting, jewelry making, and pottery. This month’s class covered a skill that was unfamiliar to me: Arashi Shibori Silk Dyeing. Michelle and I decided to try the class and check it out. 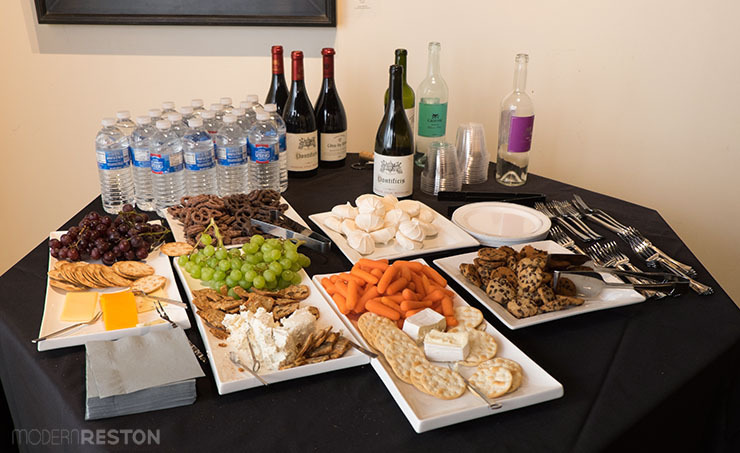 Design and Wine evenings take place in the Post Gallery space at ArtSpace Herndon. As we listened to the instructor, we were surrounded by lovely artwork from the gallery’s exhibit called Warm Observations: People and Places. This exhibit has now ended, unfortunately, but I really enjoyed it. A participation fee of $30 covered our art supplies, refreshments, and two glasses of wine. The event lasted for two hours, from 7-9pm. Acoatzin Torres of Monarca Designs was the guest artist for this evening. 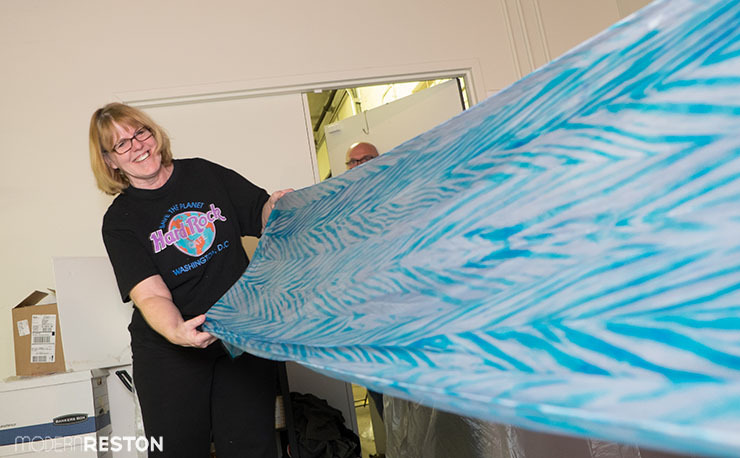 Acoatzin creates hand-dyed silk shawls, scarves, and ties, and he guided us through the process of wrapping and dyeing silk fabric. He demonstrated the Arashi Shibori technique of wrapping the silk scarves around a pole, to create diagonal pleats and resists in the fabric. After we bound the fabric onto the pole with string, we painted fabric dye onto the exposed areas. We could choose from a large variety of dye colors. After the dye was set and fixed, Acoatzin helped us unwrap our fabric from the poles, and see our completed scarves for the first time. It was fun to see everyone react to their mystery creations. None of us knew quite what to expect! It was fun to discover a chevron scarf hiding under all the pleats and string. Modern Reston’s Michelle Schoening (left) and ArtSpace Herndon’s Anna Schoenfeld (right) modeled their scarves for my camera. It was a total coincidence that they chose similar colors! Design and Wine is a casual, noncommittal way to play with a new art technique. It’s a lot of fun, and it would make for a memorable date night or girls’ night out. I’d even go by myself, for a relaxing creative outlet. And for the wine and chocolate, obviously. ArtSpace Herndon is located at 750 Center Street in Herdon. Design and Wine events are on the second Wednesday of the month from 7 to 9 p.m. and limited to 25 participants. A $30 fee covers all supplies and two glasses of wine. Registration is required with payment in advance. To register, call 703-956-6590.